Step 1 - Log in to https://billing.digitalpacific.com.au and click on ORDER A SERVICE. 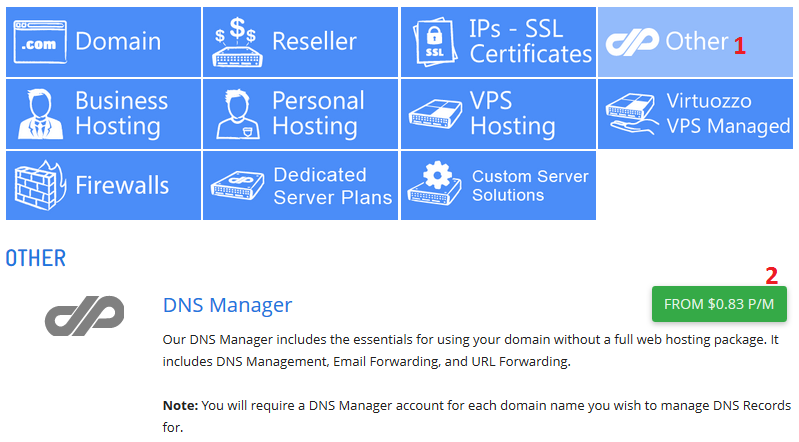 Step 3 - Select how long you wish to purchase DNS Manager for, and the appropriate DNS Manager. Then just click CHECKOUT. The Digital Pacific DNS Manager comprises of 4 separate areas to manage your domains. You can click on the headings to go to more detailed instructions on each item. You are able to add or edit A-Records, CNAME, MX Records and TXT Records with this tool. E-mail Authentication helps the receiving server verify that the email is coming from a trusted sender. It consists of two components – SPF record and DKIM record. This will redirect your website to another website.